With ‘Allow Bluetooth A2DP output’ switched on you can select a connected Bluetooth audio output device. If you have more Audio inputs connected to your device, you can select the desired ‘Audio Input’. When your iOS device has more than one internal microphone in your iOS device you can choose the microphone and ‘Directivity’. 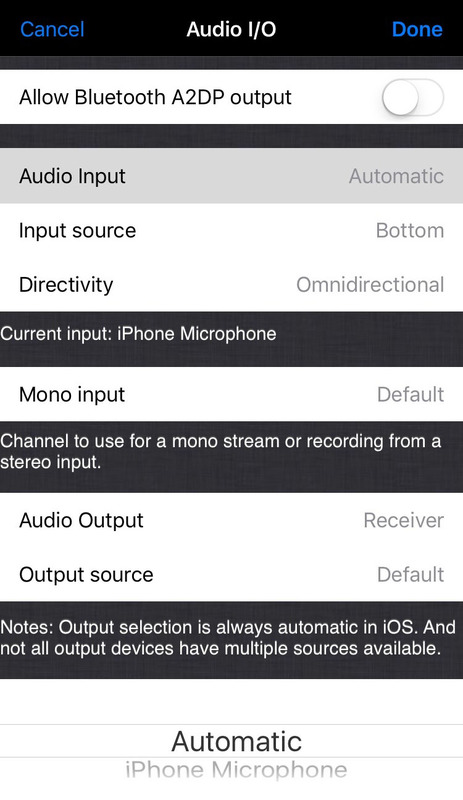 ‘Mono input’ defines which channel of a stereo audio input is used when you record or stream in Mono. Note: Since Bluetooth inputs are only received in a low 8 kHz sample frequency quality we prevented it’s use as Audio input. Note concerning the output selection: Output selection is always automatic in iOs and not all output devices have multiple source available.